As a beginner, knitting a tension square is something that you should do before you begin knitting your garment as it will enable you to measure the tension of your knitting and assist you to select the correct needle size for your project. 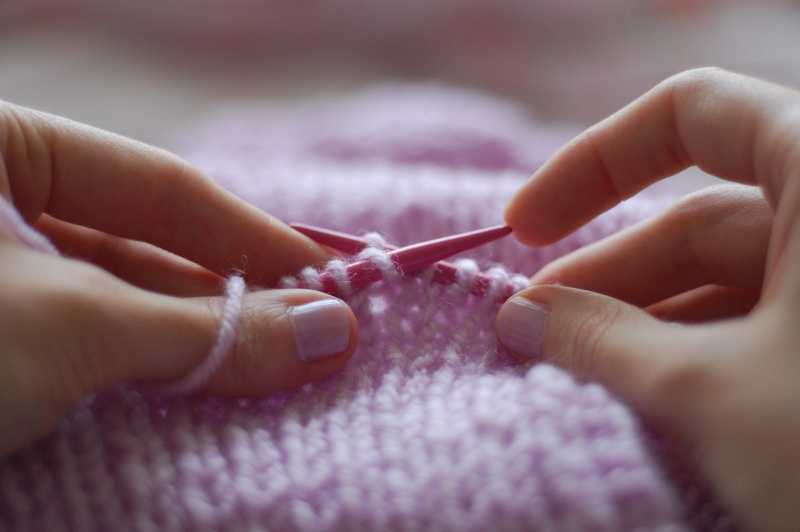 Once you have chosen a knitting pattern, you need to check your tension. Particularly if you are a beginner, because if you decide to skip this step you might end up investing a lot of time and effort to end up with a garment that is too wide or too narrow, or with armholes that are just not deep enough! Each knitter has a unique tension depending on the way they handle their wool and their needles, some knit very tight stitches and other knit more loosely. To get the best results from your knitting, you need to find out which size needles are going to give you the correct tension for that particular pattern. The recommended tension for most patterns is stated as the number of stitches and rows for a 10cm block of knitting, usually in stocking stitch. To ensure that you can measure your tension easily, your tension square should be at least 15cm square. Follow the instructions in the tension paragraph of your pattern, and cast on and knit the number of stitches the pattern recommends. Once you have finished your square, you measure your tension by laying the square flat and measuring the number of stitches and rows for a 10cm square. You do this by placing a pin close to the edge of your square, using a tape measure, measure ten centimetres from the pin and insert a second pin at that point. Then you count the stitches. If the number of stitches is less that the number specified in the pattern, your garment will be too big. If you have more stitches, the garment will be too small. Bad news, if the number of stitches isn't just about right (the same number specified by the pattern) you are going to have to do another square. If you had less stitches, try needles the next size down. If you had too many stitches, try needles the next size up. You repeat the process until the number of stitches is the same. Which needle size did you use to create the perfect tension square? They are the needles you should use to make your garment! What about the Number of Rows? You measure the number of rows the same way except you measure up your knitted square rather than across. Occasionally, when you are knitting a tension square you will not be able to get the correct tension for both rows and stitches, so you will have to make a decision about which needle size to go with. It is generally considered to be better to get the tension right width-wise as the length can be adjusted quite easily during knitting by increasing or decreasing the length underarm or the sleeve length. Most patterns will give them as measurements rather than rows so it should not be a problem. But if you pattern does specify these measurements in rows, it is easy to calculate the equivalent in centimetres as you know the recommended number of rows to 10cm. For example if the pattern tells you to knit 50 rows and the tension is 40 rows to 10cm, you just divide 10 by 40 and multiply by 50. Just in case you are wondering, in the example you would knit for 12.5cm!